Great pillow. Super soft and great quality. Experience a restful night of sleep with this plush 700 fill power cotton sateen pillow. This 400 thread count pillow offers luxury comfort. Perfect for side and back sleepers, this pillow is filled with a combination of white goose down and feathers for your most perfect night of sleep yet. Machine washable and dryable for your convenience, this pillow comes in your choice of jumbo or king size making it the perfect addition to any bedding ensemble. I am pleased with this "White Goose Down Pillow." But, do note it is: 10-percent "White Goose Down" and 90-percent "Feather Fill." It is not entirely "Goose Down," as the name might suggest. The "Feather Fill" does provide some firmness, however. Otherwise, I think it would be too soft. Overall, I'm happy, with the Pillow. But, I'm also glad I could use my Club O Rewards, toward this purchase, since Down Pillows are expensive. I got many of these. They are quite fluffy and soft, while still maintaining some good support when sleeping on it, would not be too firm like my other pillows. No feather/down smell, very clean, comfortable cotton materials, and absolutely no poky feather roots. And quite quiet, no feather sounds. According to the labels it even has two layers as construction, the 10down/90feather as posted on website is just one layer, another layer is at least 75% down. I guess that explains the fluffiness and comfort from it! Overstock should post that label info online, it's good to know it has much more than just 10% down! I am so annoyed that I have to deal with returning these. They were advertised as down pillows. They are 90% feathers, Read the fine print, click every possible drop-down box for hidden information on these "down" pillows. Great price on a perfectly overstuffed down pillow! More fill than a pillow twice the price! I looked everywhere, even had a nice 40% off coupon somewhere else, but this had a higher fill power, great reviews, and still a better price. I love it! I was incredibly annoyed to open the package and find the pillow had obviously been used and returned and then sold to me as new. I am not a difficult customer and I rarely return items. Infact, I decided to keep this pillow because I honestly don't have the time to return it. Other than the obvious signs of "limited" use the pillow is fine. I used a pillow cover so I could feel even a little bit comfortable. It's for a guest room so I am sure after it airs out it will be fine. HOWEVER, I will never shop with Overstock again after this experience. If they cannot hire people who can show respect for customers and have no over-sight of the products they push and sell then I no longer need to be a customer. I am disgusted with the entire situation. Nice pillows. The feathers are not too soft. Your head is not flat on pillow by morning. The cover on pillow is really thick nice quality cotton. I definitely recommend these pillows, if you want feathers. These pillows were advertised as white goose down, however they are only 10% down. The description is very misleading. They are white goose feather pillows. This is a very nice pillow. I sleep on my back and side and it fills the bill. But it is not a 100 per cent down pillow.. Not what I thought I was ordering but still pleased with the purchase. These pillows are great. Cool, puffy, soft and a delight to lay my head on. If you like a medium firm pillow, this is it. My husband finds it too high and a bit too firm to sleep on. 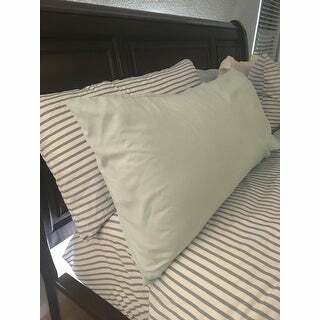 I bought this pillow for my husband, he likes that he can shape it the way he wants it when he sleeps, and I like the way it bounces back and looks nice when the bed is made. I just bought 2 more for the guest bedrooms. They are pretty, but, I ordered firm pillows & they are the flimsiest pillows I have ever seen. Was notified via email that package was left in the building mail room. Driver did not ring my apartment, I went downstairs and there was no package in the mail room. "How much does this pillow weigh? Thanks so much." This is 2.5 pounds for the jumbo and 3.5 pounds for the king. They got good reviews and I needed good down pillows.They were very reasonable. "What is the ratio of down to feathers? "